Zuerst habe ich die Tags ausgestanzt und mit Distress Inks in den Farben Candied Apple, Fossilized Amber, Twisted Citron mit einem ganz klein bisschen Mowed Lawn am Boden, Salty Ocean und Wilted Violet den unteren Teil eingefärbt. 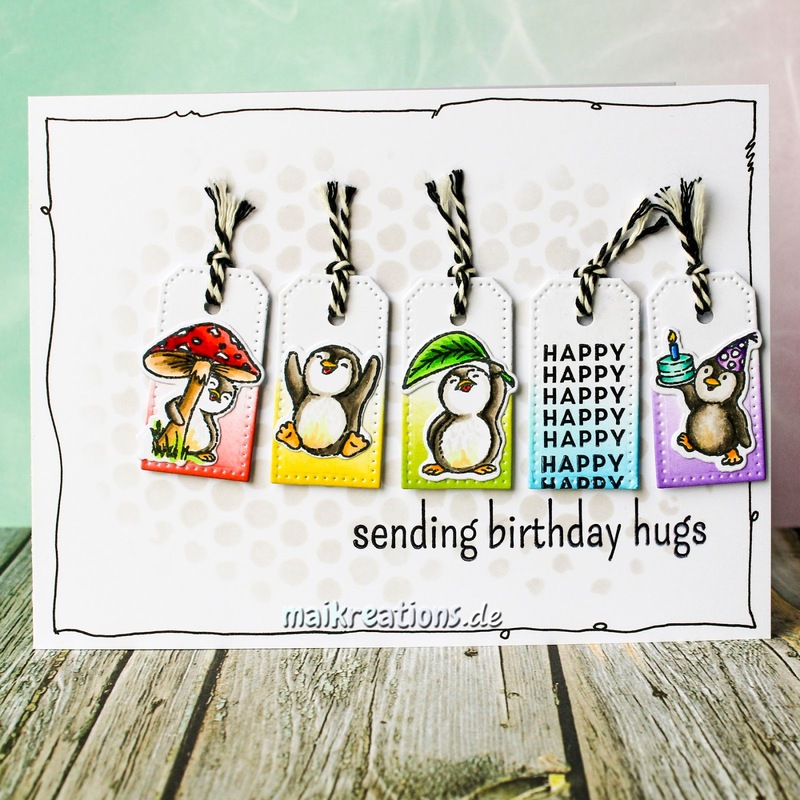 Die kleinen Pinguine habe ich anschließend coloriert und auf die Tags geklebt. I started with die cutting the tags and colouring them with Distress Inks in Candied Apple, Fossilized Amber, Twisted Citron with just a tiny bit of Mowed Lawn at the bottom, Salty Ocean und Wilted Violet. 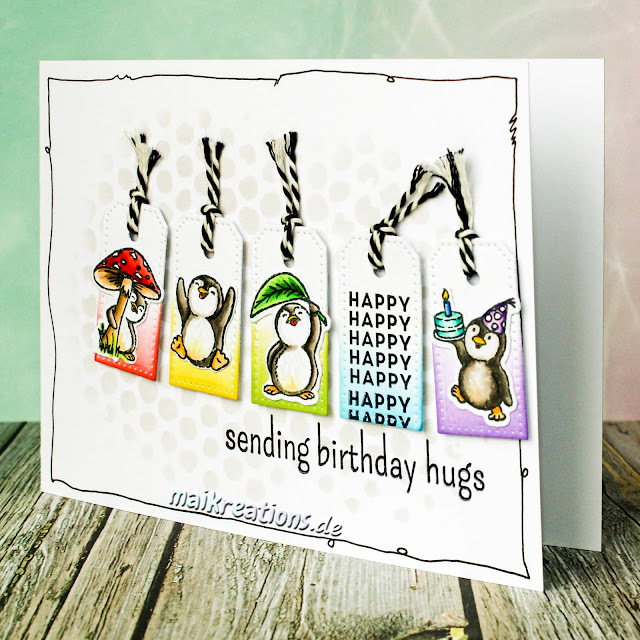 Next I coloured the little penguins and glued them directly to the tags. Deep Ocean Challenge "Cute and Cuddly"
Shopping Our Stash "Stashed Stencils"
Sweet Stampers "Things with Wings"
Always Happy Birthday "Anything Birthday Goes"
Oh my gosh!! how cute and adorable is this??!!! 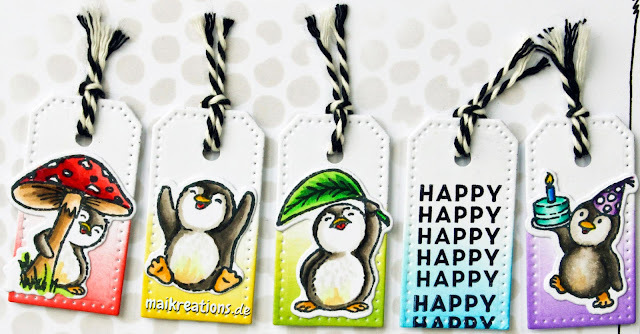 I love this sweet little penguins on this tiny tags, beautifully colored, the subtle stenciling in the background, allows them to stand out, so cute!! Thank you for sharing with us at SHOPPING OUR STASH, hope you come and play again next time. Cute! Thanks for joining us at Always Happy Birthday. :) So cute! Love those happy penguins. Thanks for sharing your card with ATSM! Oh... ich liebe Pinguine und deine kleinen vier sind ja mega knuffig. 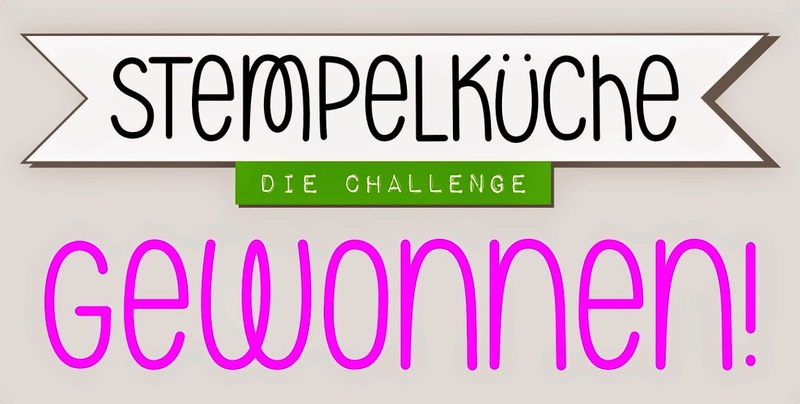 Tolle Farben und eine klasse Kartengestaltung. awww i love this, super sweet! 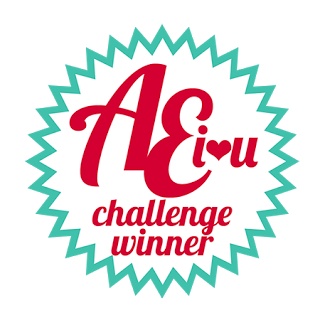 thank you for playing along with us at simon says stamp wednesday challenge! So sweet! What a great design! I must remember this idea - love your card design. And the stenciled BG is perfect! Oh, die Pingus sind so süß.